Dale Henderson, the renowned cellist who founded Bach in the Subways, will return to Bloedel Reserve on the evening of September 3rd for the final concert in the Reserve’s Summer Concert Series. Together with Atlanta Symphony principal harpist, Elisabeth Remy Johnson, he’ll be bringing us a unique and lively program of music for harp and cello. 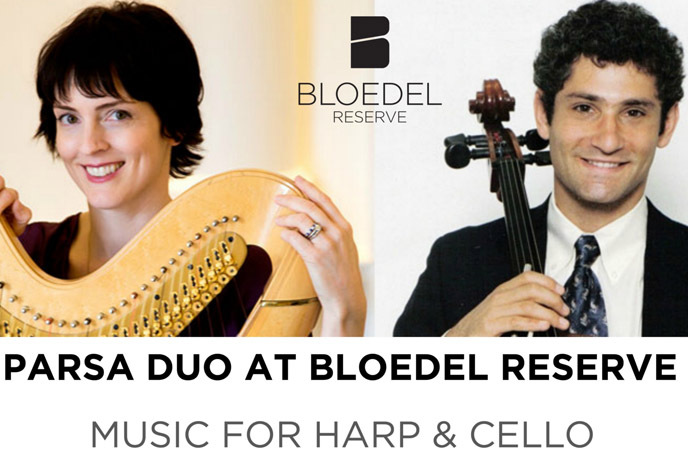 These two accomplished musicians trained together in Boston as young students, and reconnected in 2015 to form Parsa Duo. Since then, the popular pair have performed around the country, their unusual instrumental pairing garnering great acclaim. For more information, or to order tickets, visit http://bloedelreserve.org/event/summerconcerts/. Credits: BCB host: Channie Peters; BCB audio editor: Barry Peters; social media publisher: Diane Walker.